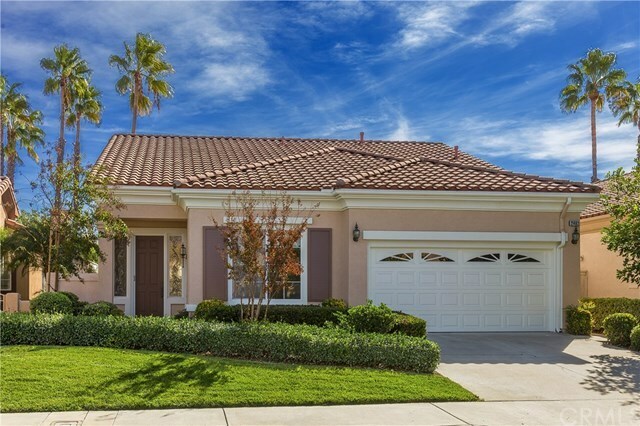 Single Story Home Situated In The Prestigious Gated 55+ Community Of Palmia, Located In Mission Viejo. This Beautiful, Move- In Ready Home Has Upgraded Wood Floors Throughout, a Freshly Painted Interior, and Recessed Lighting With Brand New Crystal Chandeliers. There Is a Lovely Master Bedroom Suite As Well As a Secondary Bedroom That Also Boasts an Attached Full Bath. The Master Suite Features a Spacious Walk In Closet With Plenty Of Built Ins, a Spacious Bath With Dual Sinks, And a Separate Tub And Walk In Shower. The House Is Open Concept With a Beautiful Layout Allowing Plenty Of Natural Light To Flow Throughout. The Backyard Is Very Spacious With Low Maintenance Gardening To Relax And Enjoy The Outdoors. The Large Two Car Garage Allows Plenty Of Room For Two Cars Plus Lots Of Storage With Built In Cabinets and a Work Bench For All Your Hobbies. Some Of Palmia's Highlights Include a Community Clubhouse Which Offers a Game Room, Library, Work Out Gym, and Ball Room. Additional Amenities Include a Resort-Style Swimming Pool, an 18-Hole Putting Green, Tennis Courts, Bocce Ball, Volleyball, Basketball, and Tennis Courts. Also, Be Sure To Take Advantage Of All That Mission Viejo Lake Has To Offer! Located Just Minutes From Shopping, Restaurants and More!